this is a message to inform you that we are having to cancel the meeting scheduled for October 30th (Thursday) Topic: Facilitating interdisciplinary exchanges across classrooms Time: 3:00-4:30pm Place: I.K. Barber Learning Center Room 2.22A. Please stay posted for up-coming details concerning the November (27th) meeting, which may incorporate the topic of this cancelled meeting or could exclusively focus on designing interdisciplinary curriculum. we are inviting faculty, students, and staff to participate in the next meeting of the ICoP as a presenter on October 30th (Thursday). we had preliminarily selected the topic of ‘facilitating interdisciplinary exchanges across classrooms’, but we are open to variations or alternatives (see earlier blog post for our proposed program of activities for this academic year). such a presentation can take any form: discussion of experiences, workshop for making exchanges happen in the future, or anything else you can dream up. we had thought that the session could explore how teaching and learning can benefit from interdisciplinary exchanges. The hope is that our community can reflect on successful interdisciplinary teaching collaborations, and lay some structural ground work -in the form of information exchange and matchmaking- of how interdisciplinary teaching exchanges across UBC can be facilitated. Details: This session looks to explore how can teaching and learning benefit from interdisciplinary exchanges. The hope is that our community can reflect on successful interdisciplinary teaching collaborations, and lay some structural ground work -in the form of information exchange and matchmaking- of how interdisciplinary teaching exchanges across UBC can be facilitated. we are pleased to announce. or remind you, of our first meeting of the academic year on Thursday September 25th from 3:00 pm – 4:30 pm in the Irving K Barber Learning Centre, Fraser River Room (Room 2.27). Please visit the event page here to register. Given that this is the first meeting of the year, and in the new ICoP structure, we invite participants to help us explore the meaning of ‘interdisciplinarity’. There are many neologisms that are often conflated with interdisciplinarity (i.e. multidisciplinary, crossdisciplinary, nondisciplinary, transdisciplinary) it is our hope to explore what interdisciplinarity is, and what sets it apart –if anything- from other practices. Conor Douglas on behalf of the ICoP co-facilitators. Please join us for the ICoP Cafe to enjoy coffee, cookies, and conversation about how the ICoP can support your interdisciplinary teaching and learning. At the meeting, we will introduce our new ICoP co-facilitators: Adriana Sedeno and Conor Douglas. This event is open to anyone in the UBC teaching and learning community. Please feel free to bring your colleagues who may be interested in the ICoP. The ICoP February meeting took place at the Seminar Room at CTLT on February 12, 2014. 1. Welcomed new faces to the iCoP. 2. The call was put out for a new co-facilitator to work with community members to develop and plan iCoP events. There was a creative conversation around ways to facilitate interdisciplinary conversations in this community of practice. 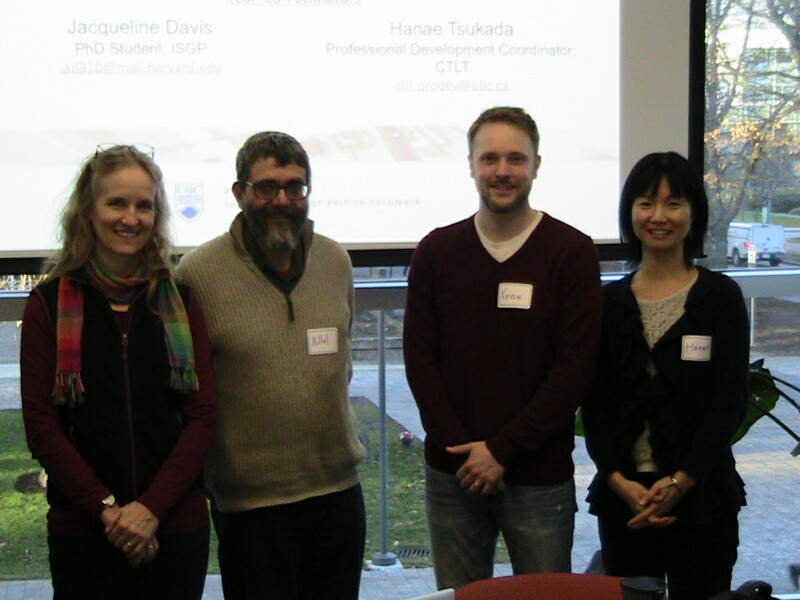 (To get involved as a volunteer ICoP co-facilitator, please send a brief statement of interest and qualifications to current ICoP facilitators, Hanae Tsukada (ctlt.prodev@ubc.ca) and Jacqueline Davis (jad310@mail.harvard.edu). 3. Our guest presenter was Jennifer Xenakis from Pathology & Laboratory Medicine who discussed how inviting an outside lecturer can contribute to the value of a course which in this case was on toxicology. Jennifer spoke from her breadth of experience as an educator. She began by taking the perspective of today’s students who often ask, “Why should I attend classes when I can learn online?” The added value of the classroom, Jennifer pointed out, is interaction with others and learning to work together. An instructor should not only teach material, but has a moral obligation to create an environment conducive to positive change. To facilitate interactive learning, an instructor needs interdisciplinary tools to help a diverse group of students connect with each other, open their minds, and break down the silos of disciplinarity that can impose limitations on bigger thinking. An instructor can model bigger thinking herself by recognizing that there are things she doesn’t know and bringing in an expert as a guest teacher. For her course on toxicology, students learned about biological and chemical toxins and their uses in terrorist attacks. Jennifer brought in Dr. Richard Price professor of Political Science at UBC specializing in international conflict, peacekeeping, and security. To help students apply their understanding of biological and chemical weapons, Dr. Price will be preparing and delivering a lecture/interactive session with students March 2015. Using skills previously learned in the course, students work collaboratively in small groups to compile a literature review to critically analyze the biological or chemical weapon designated to their group and prepare and present a 20 minute presentation on the topic while their classmates prepare thoughtful questions for the presentations. Having guest lecturers come and interact with students adds more value to their physically being in the classroom and can help make their education feel more worthwhile. 4. Networking time over coffee, tea, and cookies! Our first Interdisciplinary Community of Practice meeting for the new term will be on Wednesday, February 12, 2014, 2:30-4:30pm, at the Seminar Room at CTLT. Please come join the meeting to meet new and old community members from across the disciplines. This session will include a brief presentation by Jennifer Xenakis from Pathology & Laboratory Medicine discussing the process involved in adding a new interdisciplinary lecture into a pre-existing toxicology curriculum. Bring your colleagues, your ideas for interdisciplinary activities, and curiosity and enthusiasm for building interdisciplinary into your courses! We are still looking for new ICoP facilitators. This role will offer you great opportunities for leadership, facilitation, networking, and more. Please check out the Cofacilitator role description, ICoP for details. We will talk about this opportunity at the February meeting. You can ask any questions about the role at the meeting, or please feel free to contact us with interest or questions if you cannot make it to the meeting. Our contact is in the document. Our ICoP November meeting was another success with inspiring speakers, new and familiar participants, and great discussions! We would like to reiterate our appreciation for the guest speakers, Dr. Hillel Goelman and Kevin Mehr representing the Interdisciplinary Studies Graduate Program (ISGP) and the Interdisciplinary Graduate Student Network (iGSN) respectively, as well as for those who came to the meeting. We highly recommend those of you who couldn’t make it to the meeting to check out these vibrant and resourceful interdisciplinary groups, if you don’t know them yet. Because of the lively discussions at the meeting, we ran out of time to make an announcement about an ICoP co-facilitator position. Because Hanae’s role as an ICoP facilitator has been interim, we are looking for an interdisciplinary enthusiast to work with the other co-facilitator, Jackie. This role will offer you great opportunities for leadership, facilitation, networking, and more. Please check out the Cofacilitator role description for details and contact us with interest or questions. Our contact is in the document. Please note that the proposal submission deadline for the Out of the Box conference is approaching on November 30th. The conference will be on March 21, 2014 at the Liu Institute for Global Issues, UBC. Please mark your calender for our next ICoP meeting on Wednesday, February 12th, 2014, 2:30-4:30pm. Please watch out for more details to come. In the meantime, please contact us with a suggestion or idea for our future meeting in February or after, and we wish you the best with the rest of the term and happy holidays! Kevin Mehr, a 4th-year PhD student in Genome Science & Technology, is the president of the Interdisciplinary Graduate Student Network (iGSN), the vibrant student-governed organization that formed upon the closure of the College for Interdisciplinary Studies http://igsnubc.wordpress.com/. You are warmly invited to join us for coffee, cookies, and conversation as we expand our understanding of the Interdisciplinary happening right here on campus.